I've created some functions each with a rather long argument list. In order to check whether I didn't mix up the order of said arguments I'd like to validate whether the argument has the proper unit. However, using UnitsOf in a boolean comparison works only partially; i.e. the proper unit is recognized whereas the wrong unit halts the entire function. 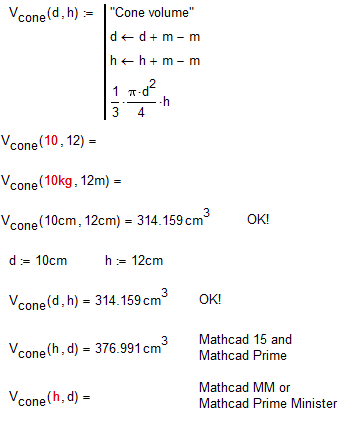 Does anybody has a strategy (MAthCad 15 please) how to check for units? Иногда это выглядит перевод усилия Google, чтобы понять, что это будет выучить язык! (or, for those of you who don't speak Russian (and for those of you who do!) Curabitur interdum felis translatione labore et videam quanta sit cognoscere lingua! If all else fails try the original Klingon or, if you're really desparate, English because sometimes it is more effort to understand Google's translation that it is to learn the language! Could you explain this a little bit more, please? It appears as though you are saying there should be some kind of link between the worksheet level name and the function argument name? This seems to go against the principle that a function's argument names have only local validity. What if the user wants to use h (horizontal) and d (depth) rather then h (height) or d (diameter)? Мне нравится метод проверки правильности физическими Величинами, что вы даете в верхней части функции. Correct translation -Thank You - Спасибо! 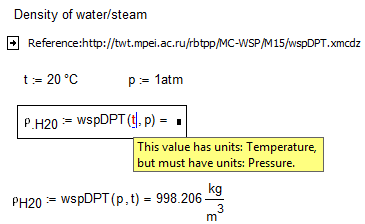 I use this method in the WaterSteamPro program - loaded and cloud version.